Told with a Texas twang, this festive tale features a dozen icons of the Lone Star state. 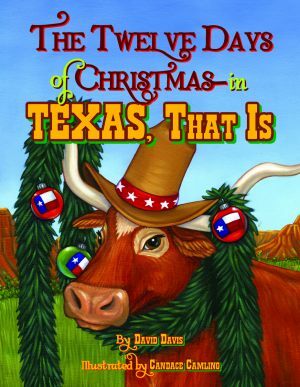 Award-winning storyteller David Davis counts down the twelve days of Christmas, sharing a surprise each day, such as javelinas, boots a’scootin’, bluebonnets blooming, and the six flags of Texas. Through fun rhymes and repetition, young readers can sing along as each of darlin’s gifts is revealed. Bright illustrations fill the pages of this western romp. David Davis is the author of the highly acclaimed children’s books. Ten Redneck Babies: A Southern Counting Book and Jazz Cats were named to the Children’s Choice Top 100 List. A finalist for the Texas Golden Spur Award, Jazz Cats was also selected for the Accelerated Reader Program. 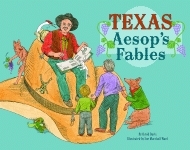 His other Pelican books include Texas Aesop’s Fables, Texas Mother Goose, Texas Zeke and the Longhorn, Rock ’n’ Roll Dogs, Librarian’s Night Before Christmas, and A Southern Child’s Garden of Verses. He also performs school visits. Davis lives in Fort Worth, Texas. Illustrator Candace Camling teaches children’s classes at Des Moines Art Center. She graduated as the valedictorian and a Studio Excellence Award-winner from Kendall College of Art and Design, with a BFA in illustration. Camling is the recipient of two Gold ADDY Awards. This is her first children’s book. She lives in Des Moines, Iowa. Free with additional minimum purchase of 2 items totalling $10 or more.